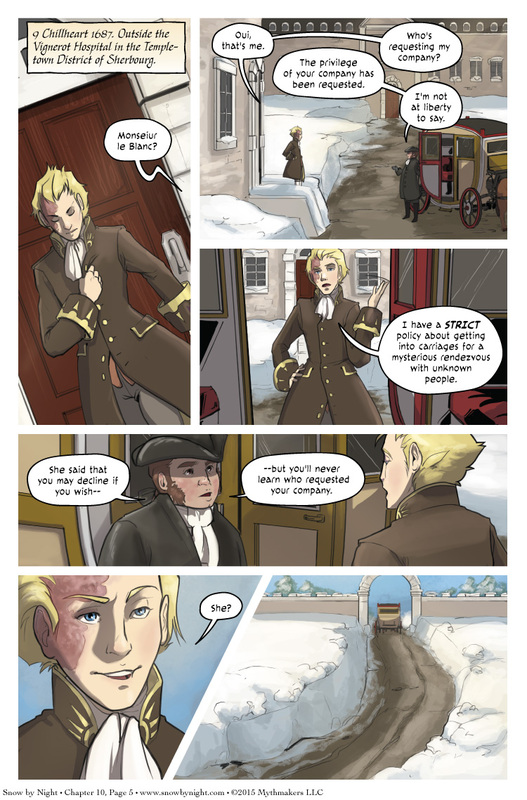 We return to Sherbourg on Chapter 10, Page 5 just in time for Jassart to leave the hospital. Though Jassart has a strict policy about getting into carriages for a mysterious rendezvous with unknown people, his policy apparently has a clause for pronouns. To see a sneak peek of his impending rendezvous, check out Julie’s tumbnails of the next page by voting for Snow by Night on Top Web Comics. Maybe it’s just me, but I’m really starting to dispise Monseour Le Blanc. How come that angry crow Manitou doesn’t attack him instead? You’ve recently begun to despise him? I’ve held him in partial contempt for the past year already. You must have really loved him before! Nah, I’ve always held him in mild contempt before, but never really wished him ill. Now, however…. The current Vote incentive has Vivianne threatening to kick him so hard all three of his aliases would feel it. I say” Don’t threaten, just DO IT!!!! DO IT NOW!!!! PLEASE!!!!!! Generally, if the tissue is still scarred, hair won’t grow there. 9th Chillheart? Only another three or four weeks before Snow-by-Night takes a summer break. Lol Monseiur le Half Blanc now. Man, I’m really starting to not like this guy. So, Snow’s new look was specifically chosen, is it the same thing for Blaise and Jassart? Yes. We had meetings about their appearance. Skype meetings, but meeting. Julie, Naty, and I went over the lines and the colors to ensure they had the right tone. Snow-by-Night is cleaving closer to the design of the period wear of the Iroquois (Haudenosaunee). Blaise has a rugged, frontier look of the voyageur. Also, tuques are easier to draw than tricorns. Jassart still has his half of the earnings from the seigneur’s job in Chapter 4 so he got a wardrobe upgrade. It’s nice to see a realistic portrayal of burn scarring; so very often is the reality of fire damage overlooked in favour of supposedly ‘rakish’ and ‘handsome’ markings entirely unrealistic for their cause.